Buffalo’s power play hasn’t been pretty as of late. But it got the job done last night against Carolina. A late 5-on-3 penalty kill kept the Sabres floating long enough to seal the game in overtime. Realistically, it should have never gotten to that point. Cam Ward made a number of big saves in the second period to keep the Hurricanes alive. Buffalo exploded for a pair in the opening 1:02 of the period and almost had a third, but Ward was up to the task. He made 15 of his 39 saves in the second period alone, keeping the Buffalo onslaught at bay until Chad LaRose could tie the score. Ryan Miller was stout, turning away 22 of 24 and rebounding nicely after yielding two goals on his first 17 shots. He has certainly earned a rest and should most definitely take that reprieve tomorrow night in Boston. While it took seven attempts for the Sabres power play to tally twice, there was some good and bad to take away from the unit. Both units continued to looks disjointed with the puck and committed a number of turnovers as a result. However, if they were able to settle the possession, there was some strong puck movement high on the umbrella. Both goals came from high puck movement and point shots. The penalty kill stayed strong and will need to remain stout as this playoff run continues. Tomorrow’s game in Boston along with Saturday and Monday carry a lot of weight for the Sabres if they hope to gain more ground. For all the hooting and holler that has been done (me included) about the top line, they answered the bell last night. 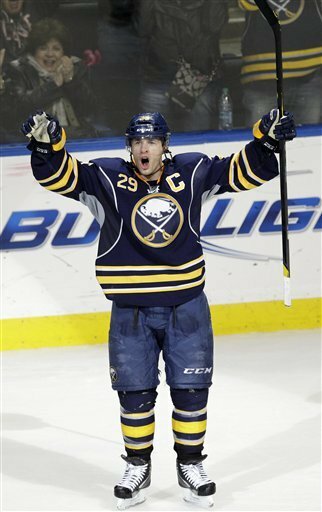 Thomas Vanek and Jason Pominville each had a goal and an assist in the victory. This just add fuel to my argument that Roy brings them down. Their success came as Roy went pointless, obviously they cannot coexist. Obviously I’m not serious, this line needs to extend that success in the next five days. Still waiting on Cody Hodgson’s first point. No matter, I haven’t hated his game and I’m still happy with the dynamic he brings to the roster. I bemoaned the thought of giving $5.5m to a player who essentially plays a strong two-way, defensive game and chips in offensively. Then I realized that is precisely what Ville Leino is currently being paid to do. Yes, he lost that faceoff clean. But his puck possession is the best on the roster and he drew a pair of late penalties due to it. His play has turned a corner these last few months, I think it is time to stop hating on him and his contract. Alex Sulzer is making me a believer. He has slightly better puck skills than Mike Weber – though he seems due one bad fumble per night – and plays a fairly similar style. Depending on defensive depth next season, I could see him getting a contract over the summer. I’ve liked his game thus far. As I said above, it is time to give Ryan Miller a rest. His play over the past few games has been showing some signs of fatigue. That isn’t to say I haven’t been pleased with the last three games, it is just time to give him a little more time to recuperate.